Beethoven. Quite possibly the most influential composer who ever lived. He gave us nine of the greatest symphonies ever written, thirty piano sonatas that to this day remain the standards by which all succeeding piano music has been judged, and eighteen string quartets that are universally recognized as among the most profound music of the last 200 years. Now he's back and ready to tell his story. 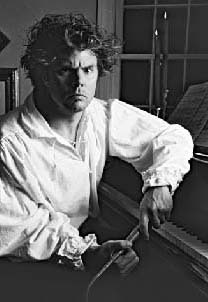 Stephen Eager brings you face to face with this giant of music, not in a dry documentary or lecture but in his one-man show "Something to Talk About," a fast-paced, riveting and inspirational reenactment depicting some of the most dramatic events in the composer's life. Watch as the young Beethoven meets Mozart for the first time, and astounds him with his natural talent. Listen as Beethoven discusses his approaching deafness and the astonishing effect it had on the last years of his life. Throughout the program Stephen performs excerpts from some of the most famous (and not so famous) piano compositions ever written. Exciting, energetic narrative performed in costume enhances the continuous recorded symphonic and chamber music, all of which combine to create a unique theatrical experience--one that will undoubtedly revise your opinion of this musical genius. "Something to Talk About" runs from 45 minutes to 1 1/2 hours, depending upon the individual needs of the venue. Items necessary for a production include one piano (preferably grand,) a small table, three chairs and a high quality CD compatible sound system. Although not possessing the name recognition of a Beethoven or Mozart, Robert Schumann provided history with one of its most interesting and tragic personalities of the Romantic Era. 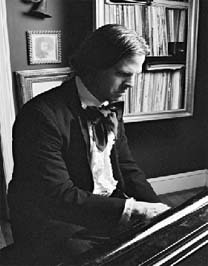 Kept from the woman he loved for seven years by her tyrannically possessive father, his piano career cut short by a devastating injury, and possessing a predisposition toward overwhelming depression, this man nevertheless composed some of the most triumphant and uplifting music of the nineteenth century. It was in large part due to his efforts and encouragement that fellow composers such as Chopin, Lizst, Berlioz and Brahms became household names. 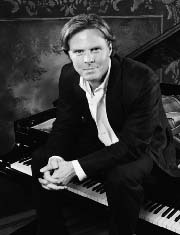 Stephen Eager once again brings his abilities as an actor and pianist to the fore and takes the audience through the fascinating life of Robert Schumann, from his hopeful beginnings as an aspiring pianist to the ultimate realization of his massive compositional genius. 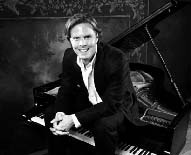 In his one man show "Schumann," you'll meet Schumann’s family, his friends and fellow composers and experience their sometimes rocky relationships. You will meet the woman who sacrificed her own career to support his and believed in him when he didn't believe in himself. Performed in period costume and driven by an intriguing story line, live piano music, and atmospheric musical sound effects, "Schumann" will hold your interest from its dramatic opening to its startling conclusion. "Schumann" is 1 3/4 hours in length and requires one piano (preferably grand,) four chairs, one table and a CD compatible sound system. Revival. It's been decades since America has experienced life-changing, society-altering revival. Do we truly understand what that three syllable word signifies anymore? If you do not know, you certainly will after you've heard the stories of the Lewis and Ulster Revivals in Scotland and Northern Ireland. Each story is complete in itself and recounts the events surrounding two of the most spectacular religious awakenings of the past 200 years. Thousands of people, children and adults alike, came to a saving knowledge of Jesus Christ on an unprecedented scale. Each of these truly breathtaking accounts lasts for approximately 45 minutes, and includes some of the most beautiful Scottish and Irish vocal music ever written. Song after song weaves throughout each story and musically enhances the truths of the narrative. You will find yourself moved and challenged as you listen to these inspiring, true tales of God's moving in the British Isles. Ideal for Sunday services, revival services, and special church and school related events of all kinds. Beautiful love songs and heart-warming stories come together in "That Look in Her Eyes." Readings from Shakespeare, Dickens, Fulghlm and others are sure to delight all who have ever been, or ever will be in love, and Steve's original songs provide a musical atmosphere that stays with the listener long after the program has ended. "That Look In Her Eyes" runs from 45 minutes to an hour and 15 minutes, and requires a piano and cd compatible sound system. This production is particularly appropriate for couples retreats, valentine banquets, marriage seminars and as after dinner entertainment..
For three weeks we have been adrift in the Atlantic Ocean. Our clothes offer no protection against the unbearable cold. And now the food is almost gone. Come experience the unforgettable life-story of a great sinner transformed by a greater Savior. 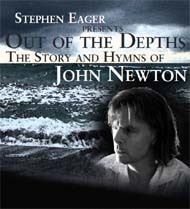 Along the way, hear some of Newton's greatest hymns set to beautiful new melodies. Click on the links below to listen to clips from each track. Sinner, Are You Still Secure? With just one week to go before graduation, 3 college students put their careers on hold while they follow their dreams. But have they waited too long to begin the journey? Will "the road less travelled" prove to be a wonderful adventure or a dead end? Beautiful music from Steve's album "A Brighter Sun," and an inspiring story make this a riveting program for audiences of all ages. Runs for 1 hour and 45 minutes.